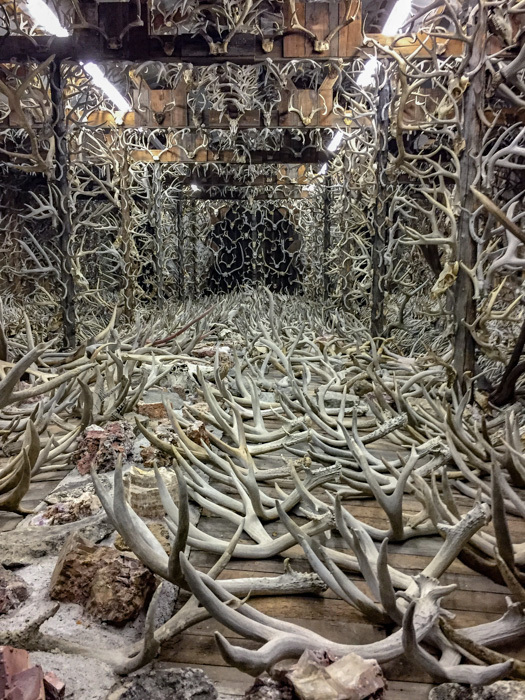 Antlers and horns collected over 60 years are carefully arranged in a dedicated 30-foot x 64-foot room. Most of the elk, deer and moose racks in his collection are displayed in a 30-foot x 64-foot room he built specifically for them and has dubbed Jim’s Horn House. There, the racks are not just piled up in a heap — they are carefully arranged, as in tribute, laid out on tables, attached to the walls and posts, and affixed to the ceiling. A 2012 Field and Stream magazine article calls the room “a cathedral of bone,” an apt description given Phillips’ reverence for the animals that once wore the antlers he has found. Sometimes there is a small piece of the animal’s history: a bullet hole through a mule deer’s antler; a broken piece of skull from a bull elk’s fight. Scattered among the antler collection are skulls of American bison he estimates date back to the late 1800s. Phillips hasn’t bought even a single antler in his collection. Though he sometimes trades for antlers, most of his collection has come from days or weeks spent hiking alone though the foothills, mountains and valleys surrounding the headwaters of the Missouri River. (The Three Forks – the Gallatin, Jefferson and Madison Rivers – merge to form the Missouri River near his home.) Those trips bring him in close contact with nature — sometimes uncomfortably close. He’s had run-ins with grizzlies and black bears as well as moose. Finding sheds is only part of the challenge. Phillips says hauling them out can be physically grueling. A successful trip may involve backpacking more than 100 pounds of antlers over miles of rugged terrain. “Pound for pound, I’ve packed them all, except the ones given to me,” he says. 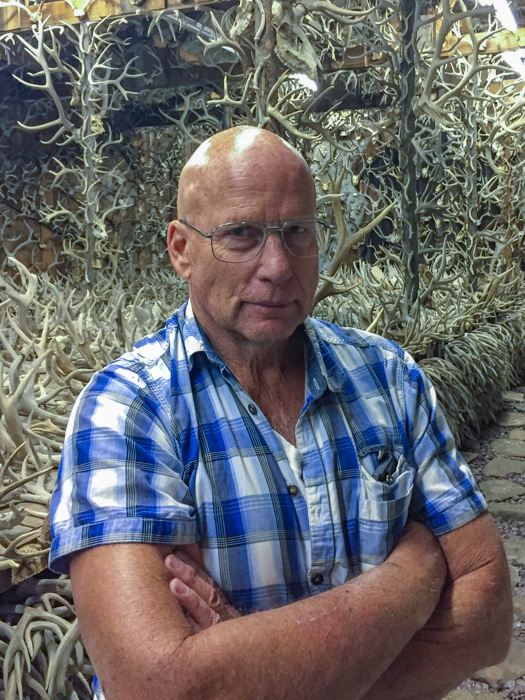 Phillips’ passion for collecting antlers began at age 10 during a family camping trip, when he found his first elk shed. (Elk, deer and moose shed their antlers each year and regrow them). While Phillips doesn’t collect antlers for the money they can provide, he notes he was able to help with his three daughters’ college expenses during the 1980s, supplementing their scholarships and part-time job earnings by selling some of his finds. Nearly 60 years after spying that first elk shed, Phillips is still at it. If time has slowed him down, it hasn’t depleted his passion for finding the bony treasures. There’s still a twinkle in his eye when he talks of heading back out. There are still a few open spaces in Jim’s Horn House to fill. And he’s always happy to open the door for anyone who wants a tour. For more information about Phillips and photos of his collection, visit www.antlerman.com.